Brain teasers! Come in and play! At first glance, it looks like a painting of an old man in profile - but his isn't the only face in this picture. 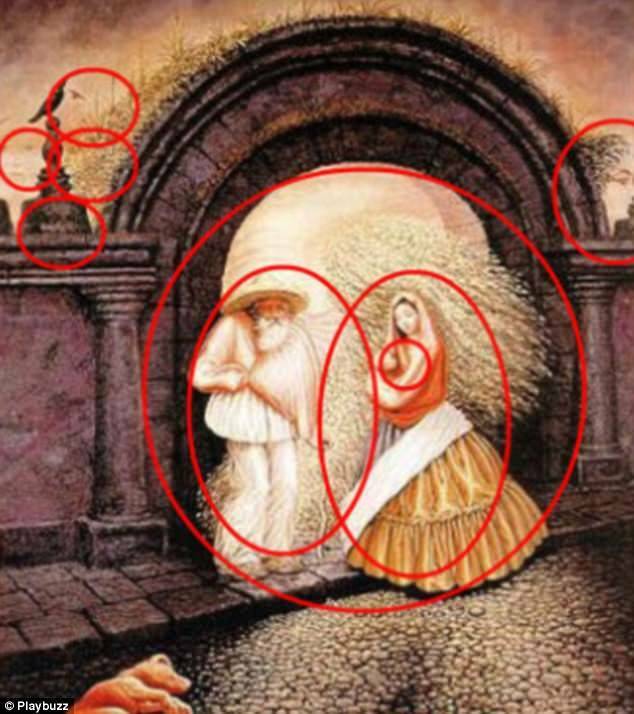 In fact, there are nine different faces hidden within the illustration, and it's your job to spot them all. The picture, posted by the gaming site Playbuzz, has left viewers scratching their heads, as some of the hidden characters are much harder to spot than others. If you need a bit of help with finding them all, scroll down to see the reveal. But be warned: you might kick yourself for not having found them all yourself. One particularly sneaky face can be found lurking towards the right of the painting, but none are on the floor near to the sleeping dog - a red herring which makes it even tougher to spot all nine. 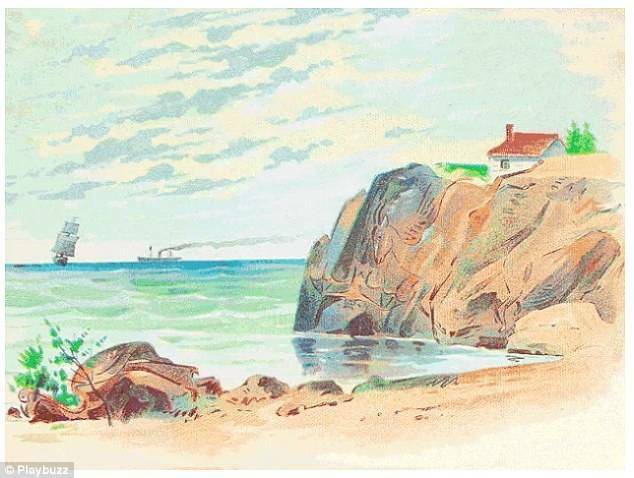 This latest optical illusion comes after a peaceful painting of a sunny seaside scene featuring four hidden animals went viral. The puzzle, also from Playbuzz, challenges you to try and find the fox, bat, antelope and flamingo concealed in the picture - and the makers say that only the overly analytical will be able to. If you are having trouble spotting the four animals then look closely at the rocks. 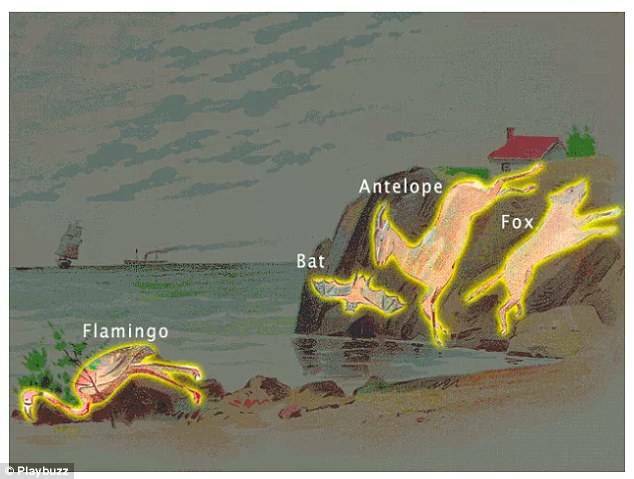 Three of them are hidden on the right hand side, whereas the flamingo, which people thought was the trickiest to find, can be spotted in the bottom left corner. Other users took to Playbuzz to claim that there are in fact five animals and that there is a dog somewhere in the picture. How many did you manage to find? 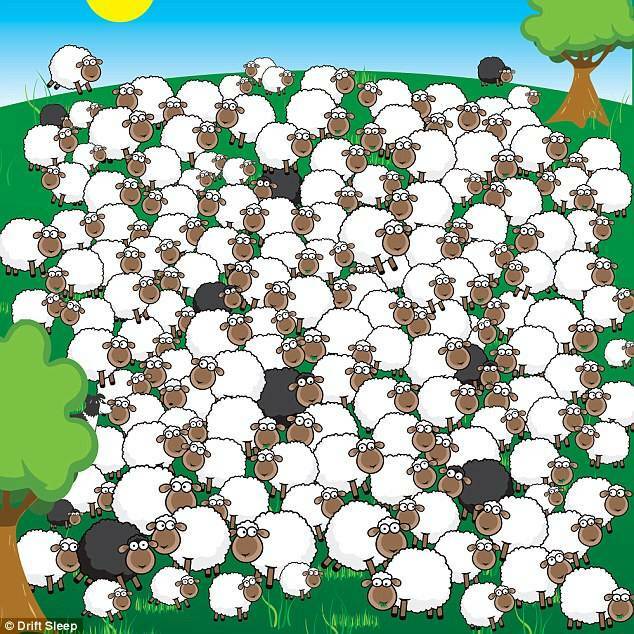 Counting sheep is supposedly an ideal way to fall asleep, but this field of woolly creatures is bound to do the exact opposite. A new Where's Wally? style puzzle challenges you to find the one sheep in the flock that's drifted off for a snooze. And the puzzle created by Drift Sleep has an added challenge as there's a sheep dog watching over them for you to spot also. While graphic brainteasers have proven popular online, it seems web users can't get enough of vintage puzzles either. The latest to wind-up the web is a retro advert that tasks players with spotting two babies hidden in the scene. 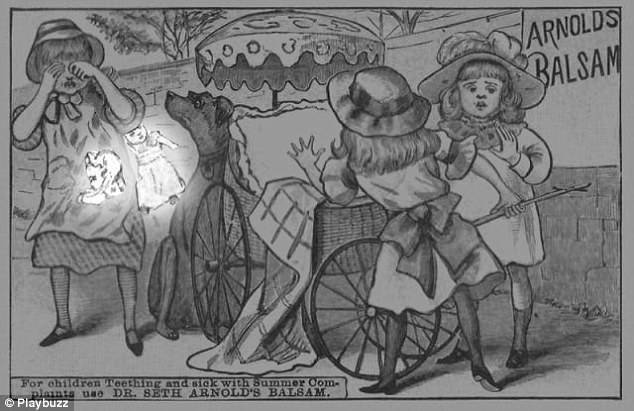 In the poster for Dr Seth Arnold's Balsam, a group of girls appear distressed as they try to find the lost infants. The puzzle, shared by Playbuzz, proves exceptionally difficult as it is entirely black and white, making it even tougher to spot anything amiss in the scene. However, those with a keen eye should be able to spot one of the children to the dog's right and another hidden in the apron of the weeping girl. Did you spot them without cheating? In another recent retro challenge shared by Playbuzz, players are tasked with seeking out a policeman in an old-fashioned advert. 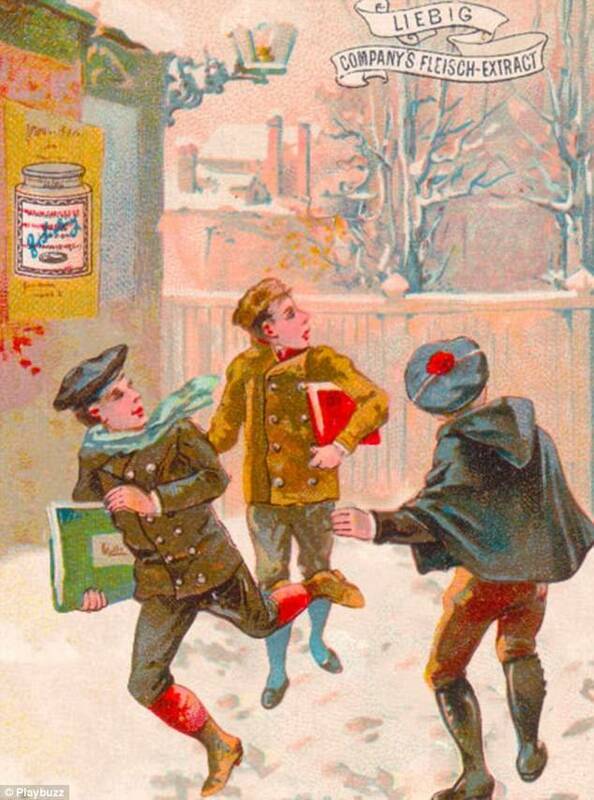 In the illustration, three young boys can be seen trying to take a short cut through a neighbour's back garden - but little do they know there is a policeman close by, and he's watching their every move. At a glance you would be forgiven for struggling to spot the officer in the drawing as his outline blends so well with the background. But if you flip the image upside down his face can be spotted in reverse in the branches of the tree. According to Playbuzz, only true workaholics will be able to spot what's amiss on the old-fashioned desk below. 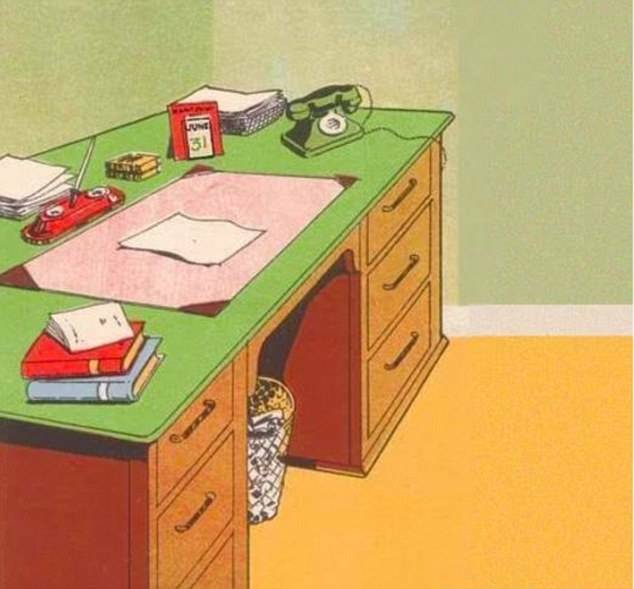 It might not bear much resemblance to your own desk, with its retro telephone and pen stand in place of a computer, but can you spot the one thing that's wrong with this picture? The desk is filled with paperwork, books and a calendar. Take a second look at that calendar and see if you can spot something amiss. 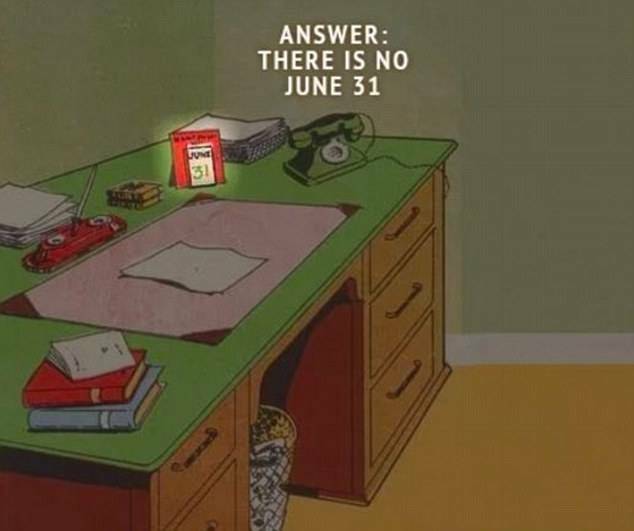 The date is, in fact, wrong, as June 31 does not exist - there are only 30 days in June. If you managed to spot it before the reveal then you are a true workaholic and are working way too much overtime, according to the puzzle's makers. Another vintage puzzle to resurface this week asks the internet to seek out the missing kitten in the illustration. Originally an advert for Dr. Seth Arnold's Balsam used to 'Cure Bowel Complaints' the tricky puzzle had been shared by Playbuzz leaving the web scratching its head. 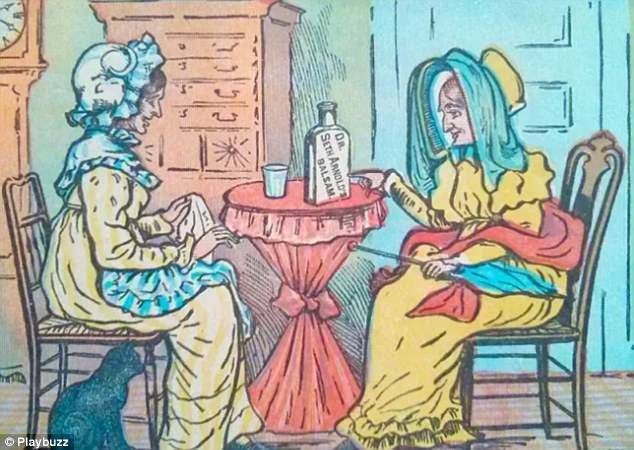 In the drawing two women sit at a table and while one of their cats is in plane view the other appears to have disappeared. However, those with excellent vision should be able to spot the pesky pet hiding in the bonnet of the woman on the left. This isn't the first retro puzzle to re-emerge with a mind-boggling brainteaser infuriating the web over the weekend. 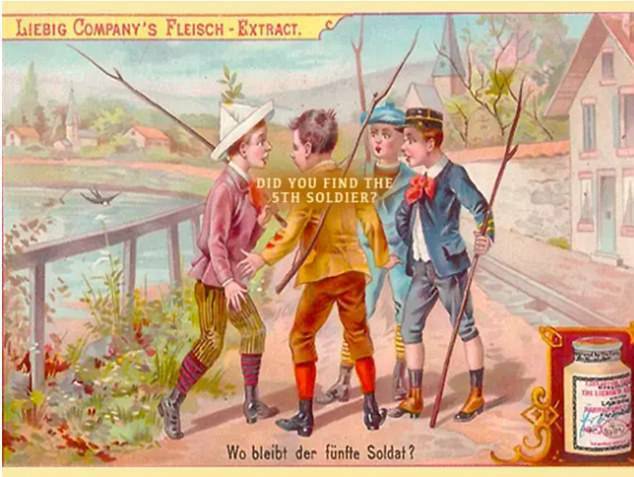 The illustration, shared by Playbuzz, asked men and women to spot the soldier's four missing friends. 'Can you spot where they be hidden?,' it asks. 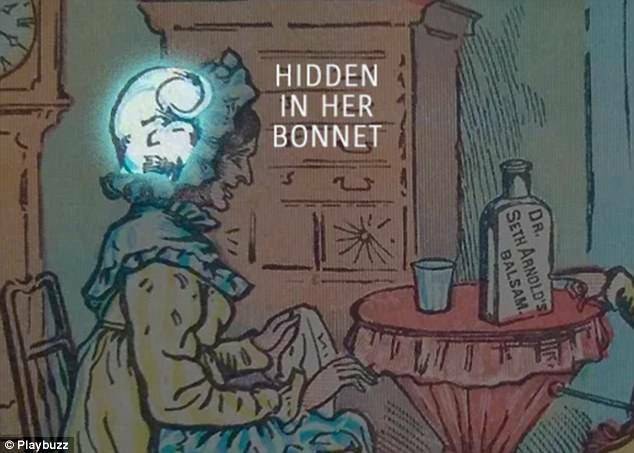 'Solving this riddle will drive you insane! We are not kidding!'. The website claims that only one per cent of the population can see the concealed soldiers, so can you see all four? The site claims that its optical illusion will quite literally have you standing on your head to solve it - if you don't go mad trying. 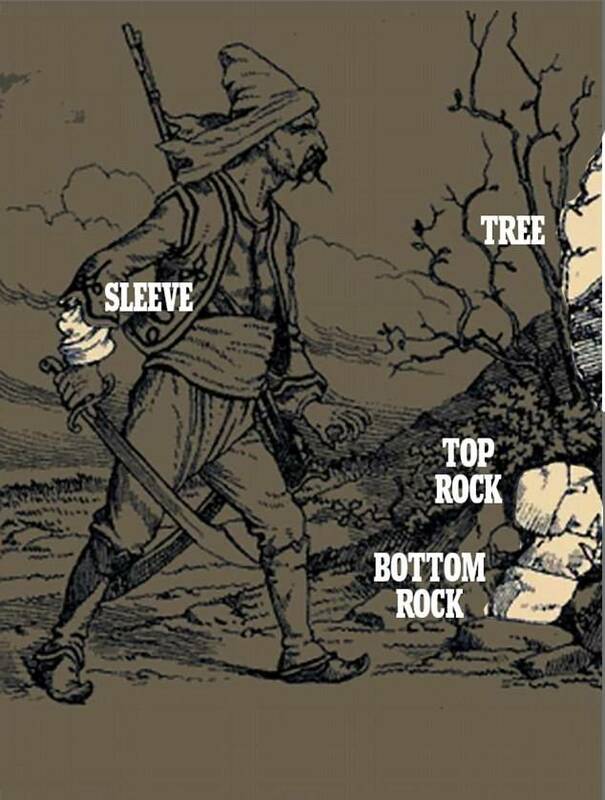 You will need to flip your head to see all four soldiers - one of whom is on the man's sleeve, one is on a top rock, another is on the bottom rock and the final one is hiding in the tree. The latest optical illusion comes after a similar one swept the web last week. It showed five young soldiers playing hide and seek in this puzzle, but one of them was better than his friends at disappearing from view. 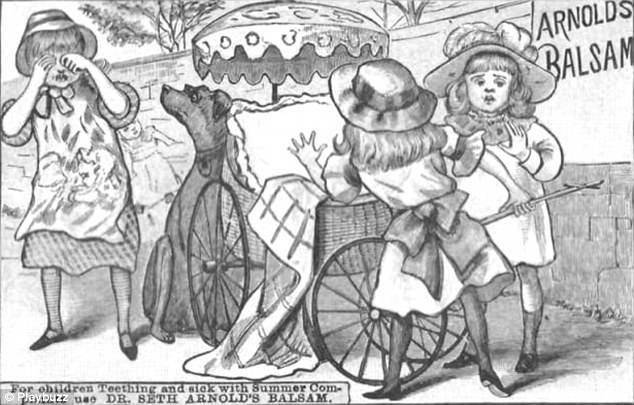 It challenged you to try and find where the fifth member of the group is lurking in the vintage illustration. The website claims that 95 per cent of people can't find him - are you among the five per cent who can? 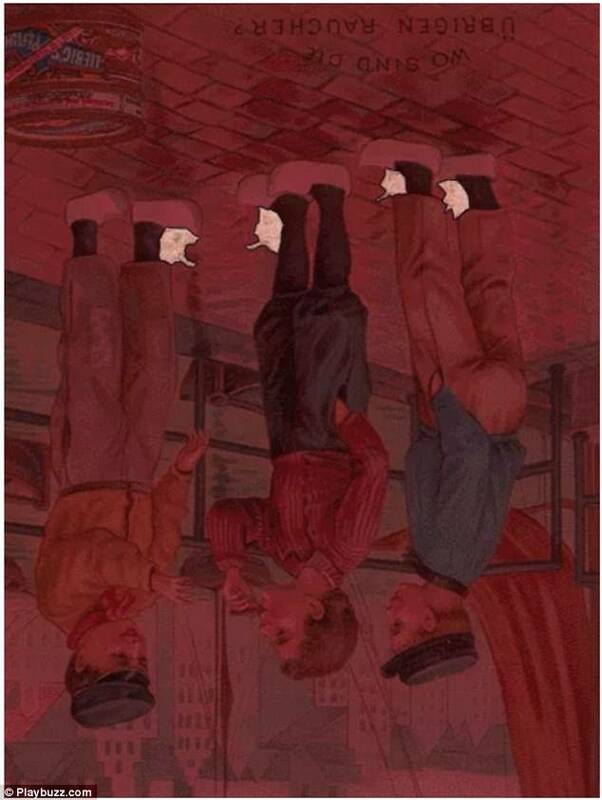 If you can't manage to spot him then you aren't alone, but you might find flipping the image upside down makes things a little easier. Even then, 49 per cent said that they weren't able to find him, and had to look at the reveal for it to all become clear. 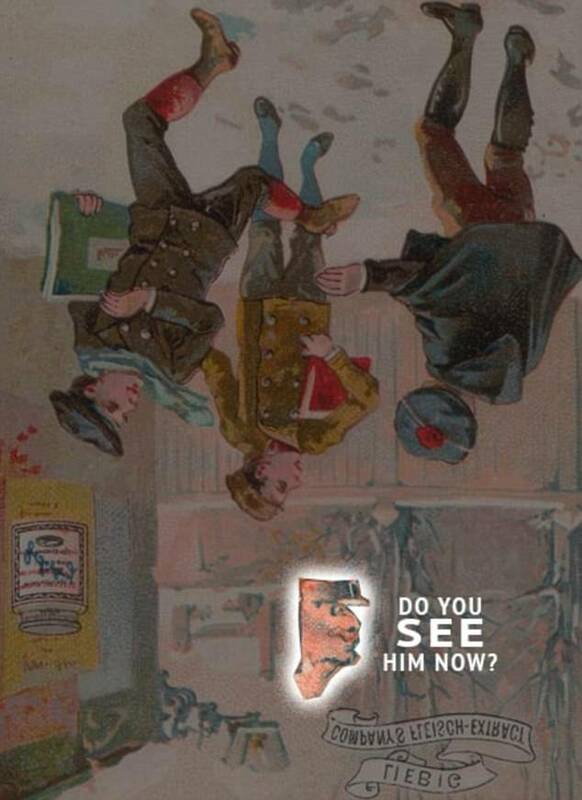 When looking at the picture upside down, the boy is in fact right above the other soldiers and can be spotted nestling in between the trees. 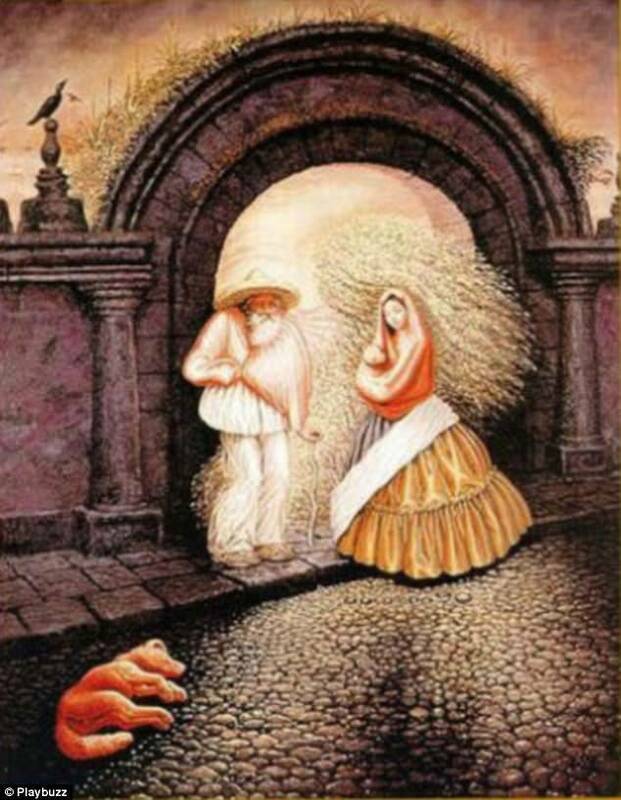 It's one of a stream of similar optical illusions that have had people scratching their heads in recent weeks. 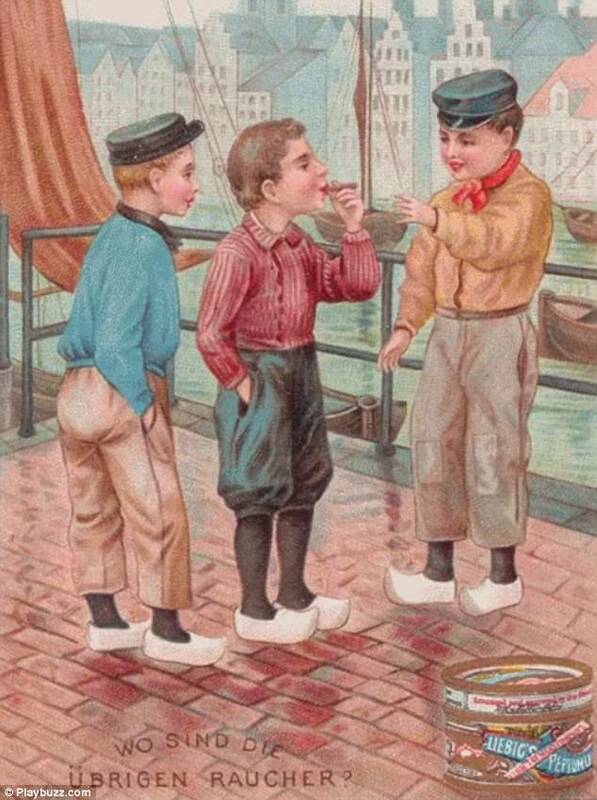 It might look as though there are only three boys in the photo below, but there are in fact seven - and the hidden friends are all enjoying a crafty cigarette. 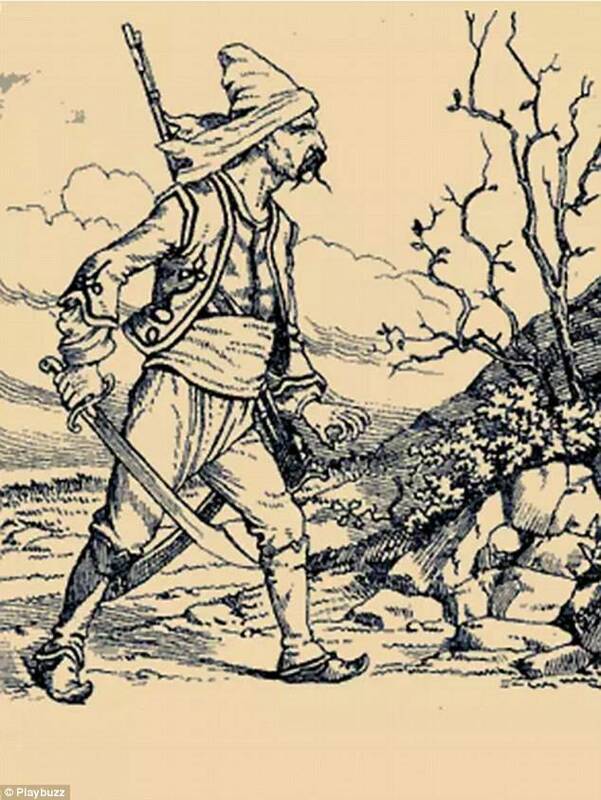 Another hidden image puzzle, posted by Playbuzz, has managed to frustrate a lot of people. A poll of puzzle fans confirmed that 70 per cent of people had to give up and look at the reveal in order to find the hidden figures. 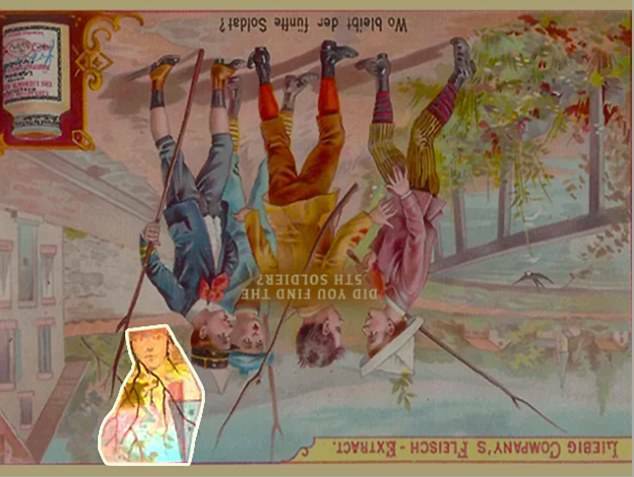 If you're struggling to find the extra characters in the vintage illustration, you might want to try flipping it upside down. This will make the smokers more obvious and might just enable you to find them. But don't be worried if you're still left battled as they are especially tricky to spot.